The only way to grow your business is by having a clear understanding of your current and past performance. Financial statements and tax returns are reports that outline your past performance but doesn’t give insight to your future performance. However, there are strategies you can implement to leverage these past-focused reports to grow your business well into the future. Do you really have a crystal clear picture of where your business stands today? For many business owners, they only have an idea. A vague idea is not enough to propel your business growth. For this reason, the first step in using your accounting information to grow to the next level is financial analysis. At first glance, “financial analysis”, is an intimidating term for non accountants. After all, most business owners are not CPAs and the thought of analyzing financial reports can feel overwhelming. This is the reason why most business owners use small business accounting services from an outside firm. However, breaking down your financial reports into more digestible parts is not only feasible but imperative. Ultimately, this formula is taking the “contribution margin” (sales price per unit – variable cost per unit) and dividing it into fixed expenses for a specified time period, usually equal to a month. Mary’s Spa charges $100 for an hour long massage. Mary’s spa incurs a $20 expense for a massage therapist, $10 of massage oils and lubricant, and another $10 worth of disposable sheets. Mary’s contribution margin is $60 ($100 – (($20+$10+$10)). Mary’s Spa’s fixed expenses total $5,000 per month, which mostly consist of rent and utilities. Mary’s Spa break even in units would be 84 massages ($5,000 in fixed expenses / $60 in contribution margin). This means Mary would have to sell 84 massages every month to cover all of her expenses and achieve $0 in profit. Mary might use this information to grow her business by cutting down on her variable expenses or charging a higher price by branding the business as a higher end massage parlor. These are just a few ways to use break even analysis to grow her business. Every business has key performance indicators or KPIs. KPIs are a way to measure how well a business is achieving its objectives. 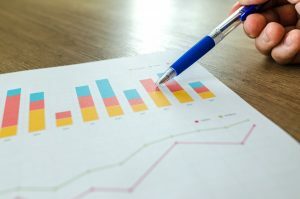 KPIs can be applied at multiple levels of your business from measuring overall profits down to products and processes. Accounting is the numerical way to measure a specific KPI. In fact, many of the most common KPIs are found directly on the income statement, like profit. Ensuring your objectives are SMART is the first step in designing which KPIs to measure. Once you have formulated your SMART objectives, the next step is deciding which KPIs to track. If you want to measure sales growth, you might decide that revenue as a percentage of growth is the best KPI to monitor. Another useful KPI is working capital. Working capital measures the difference between current assets and current liabilities. So if your company has issues paying its debt as they come due, tracking working capital as a KPI would be helpful for you in making decisions. KPIs help you and/or your management team make decisions. They indicate how well (or not) a specific area of your business is performing. With this information, you can strategize and implement decisions to improve a KPI, like reducing costs or hiring an employee. These decisions should not be made haphazardly and KPIs are your guide. The ultimate purpose of accounting is to provide information to help management and investors make decisions. You may not have the time to analyze your accounting but it should not be neglected. Consider outsourcing financial accounting services to ensure this gets done. The only way to grow your business is to rely on your financial records. It is not enough to solely rely on your gut. Instead you need cold, hard numbers and the accounting provides that.